It’s that time of the year again – that’s right, it’s my birthday. I get another year older, and I’m reminded that time is ticking, so I better make good use of it. Probably not the most inspiring first-paragraph, but I suppose, it fits the sentiment. 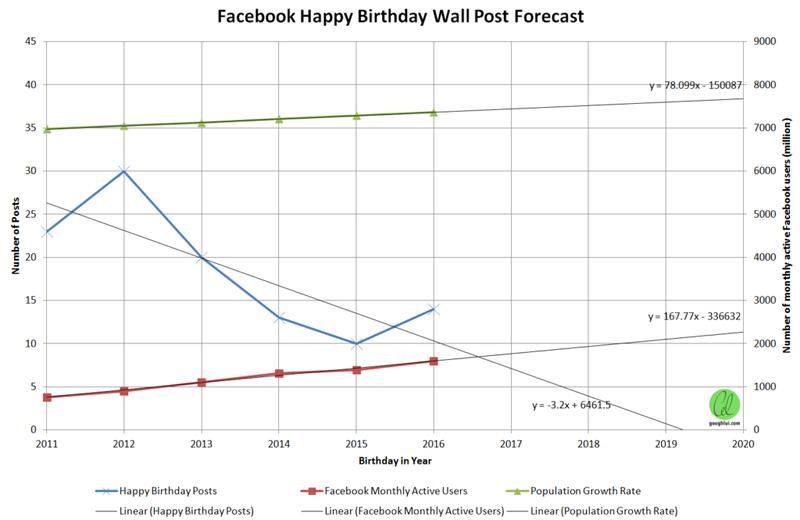 Thank you to all who wished me a Happy Birthday, in person, online, or by other means. This year, I decided to celebrate my birthday with Taronga Zoo, a renowned tourist attraction in the Sydney area, as well as an important educational, breeding and conservation facility. 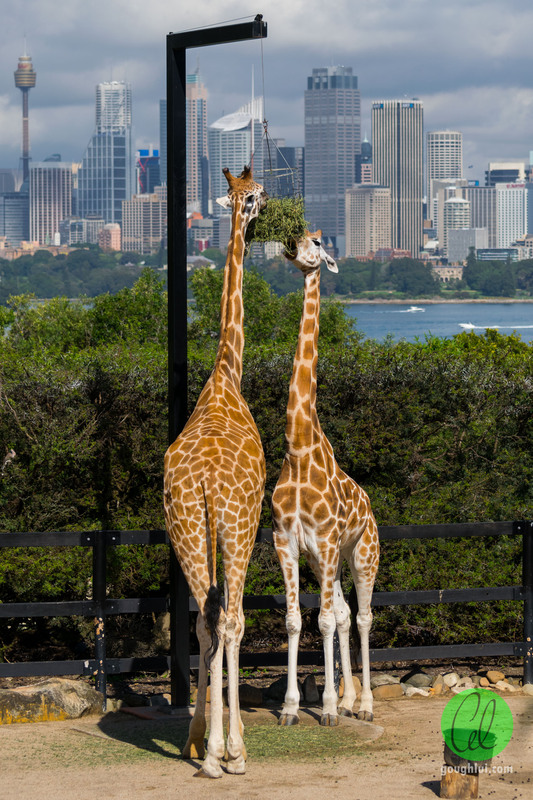 This year, on 7th October, Taronga Zoo celebrates its 100-year anniversary and as part of the celebration, they offer visitors $1 entry on the day of their birthday for those who register on their website. 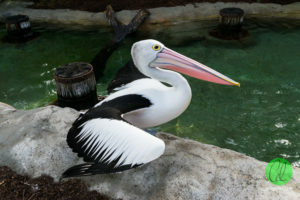 It was an offer that I couldn’t resist, as I hadn’t been to the zoo in at least a few years. This post is probably the most image heavy post on this site so far, so it may take some time and bandwidth to load. Thanks for your patience. 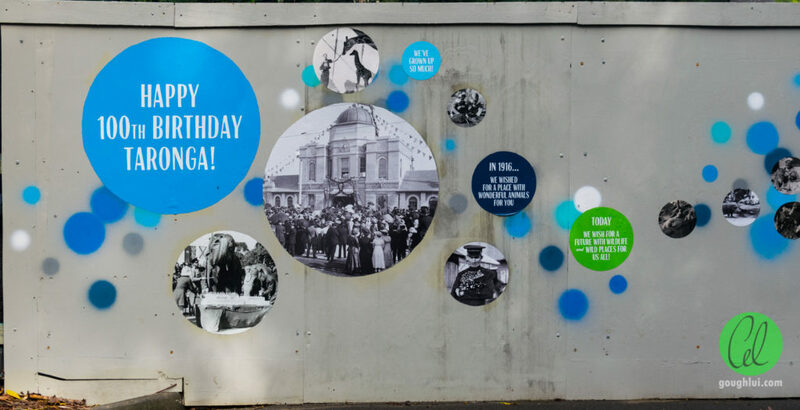 As part of Taronga Zoo’s centenary, people were asked to post or submit memories of their time at the zoo. I challenged myself and looked through my scanned photo archives to find my earliest photo at Taronga. It was a different time – cameras were mechanical and expensive, film was a scarce resource which most couldn’t afford to squander. As a result, there weren’t many photos. The dates are not known for sure, but I would have to guess very early 1990’s. 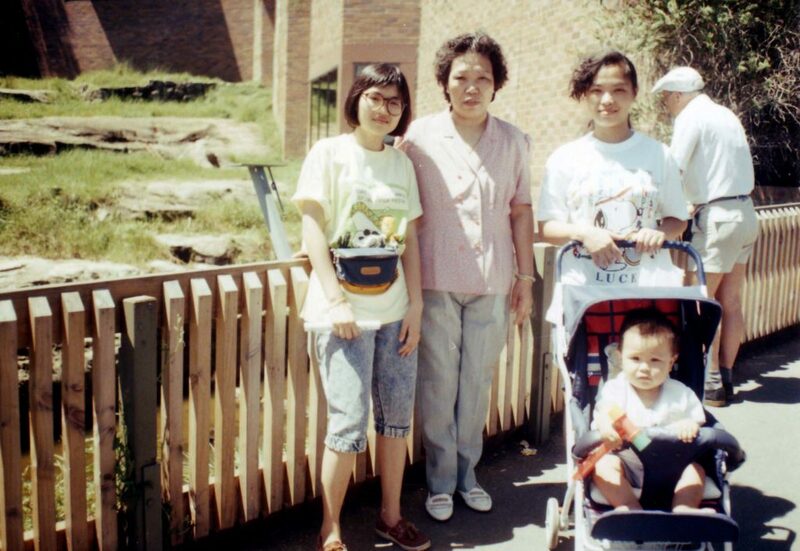 The picture depicts, from left to right, my aunt, my late maternal grandmother, mum and myself, standing in front of the chimpanzee enclosure which still looks very much the same today. I was definitely too young to remember this, but a photo doesn’t lie! 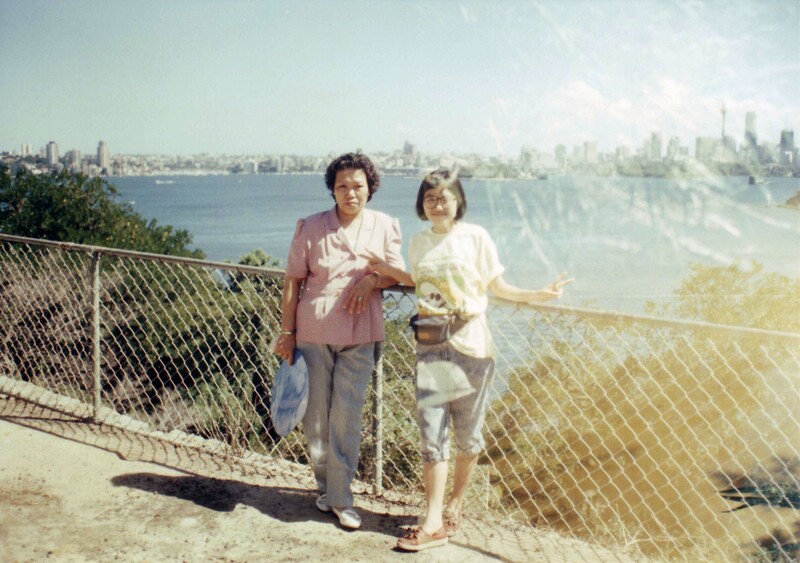 My relatives even posed for a shot of the city views from the zoo, with what looks to be some camera anomaly leading to double-exposure and possibly scratches in the film itself. 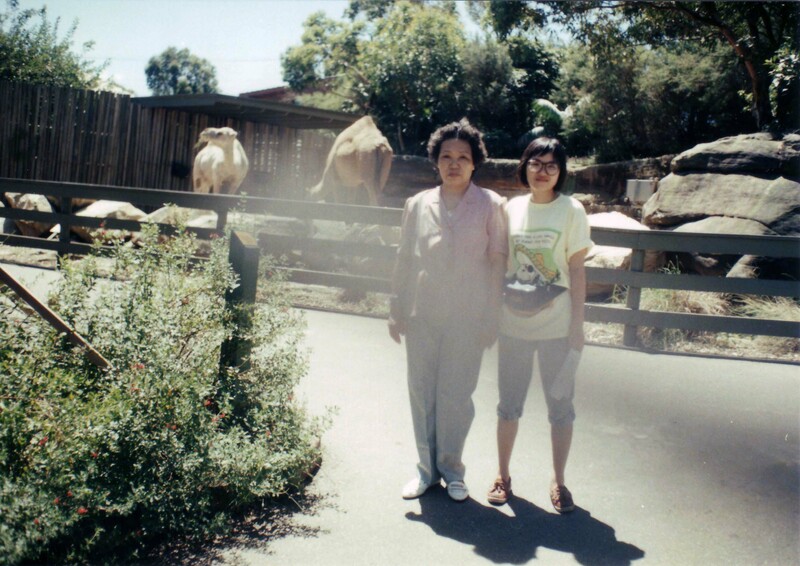 There’s a photo of my relatives in front of the camel enclosure, with something blocking the lens (or possibly flare). 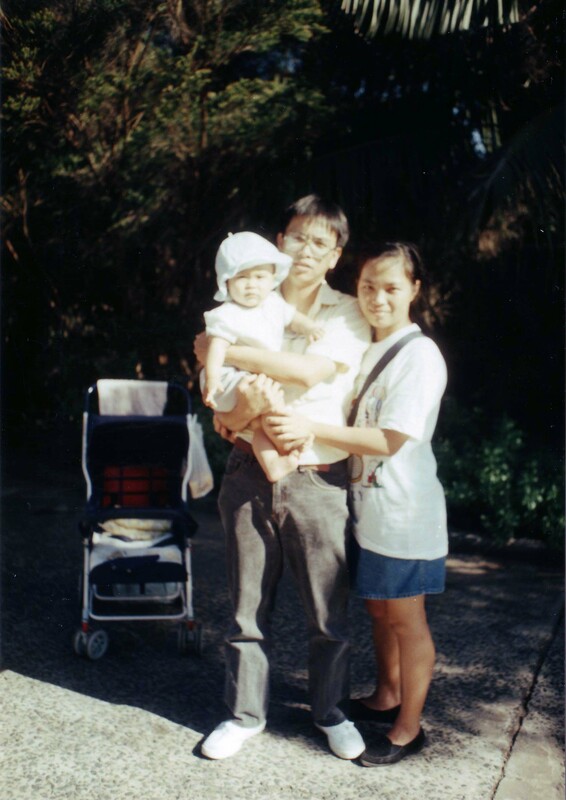 Finally, a photo of my father carrying me, next to my mother. 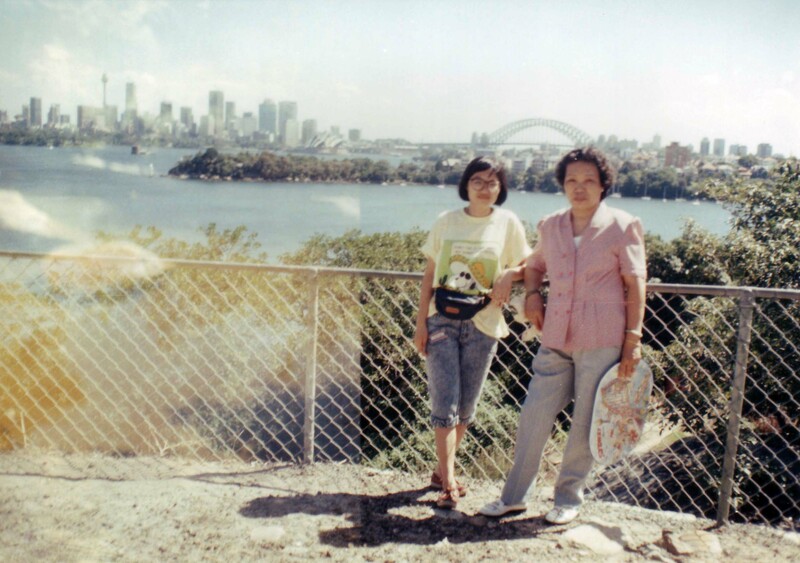 All are definite proof that I grew up with Taronga, quite literally, as it was the best zoo in the Sydney area. 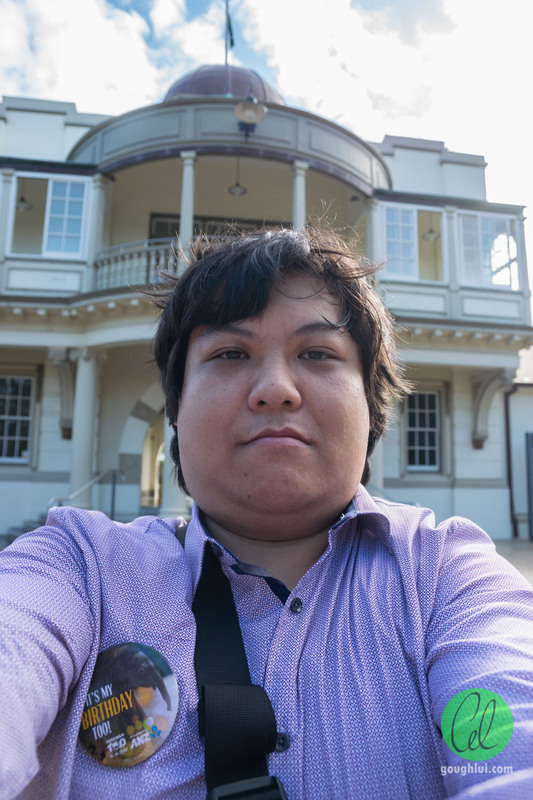 I don’t remember visiting frequently, although I may have with school excursions, and later on when I began taking an interest in photography for a day outing. 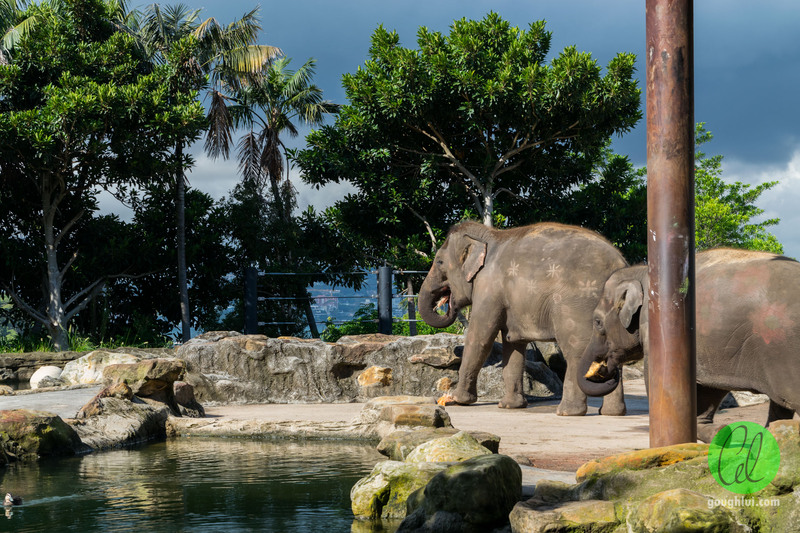 I suppose the best way to capture the memory of this visit to Taronga Zoo is to document it in a blog posting, a sort of diary of the day. 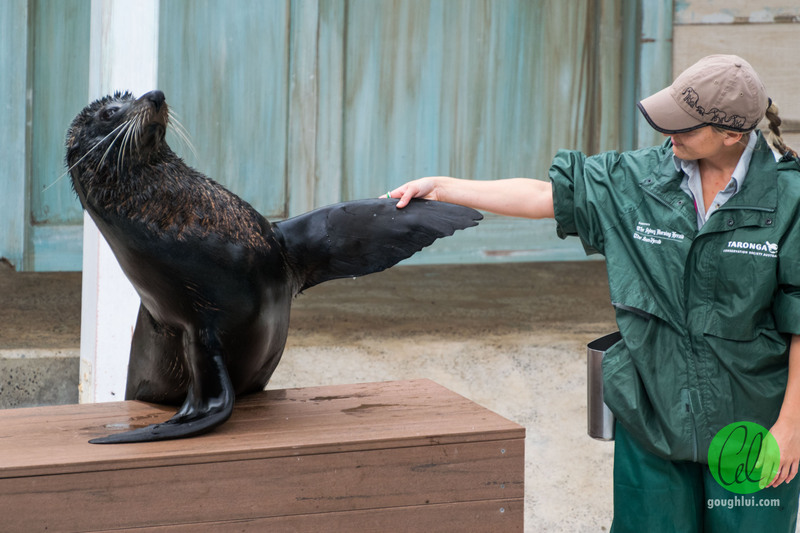 Of course, this could never replace actually going to the zoo and seeing or interacting with the animals directly. 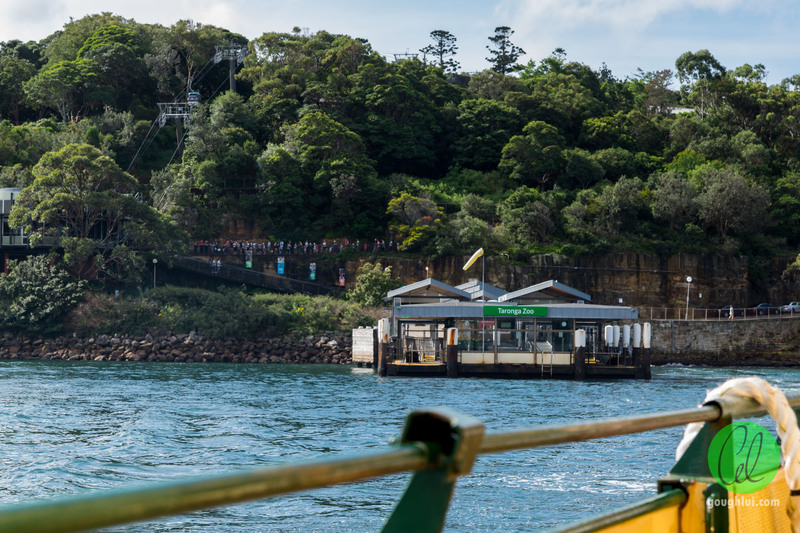 My morning began with a train trip into the city, followed by a ferry ride from Circular Quay wharf 2 (F2) to Taronga Zoo wharf on the 8:50am service. 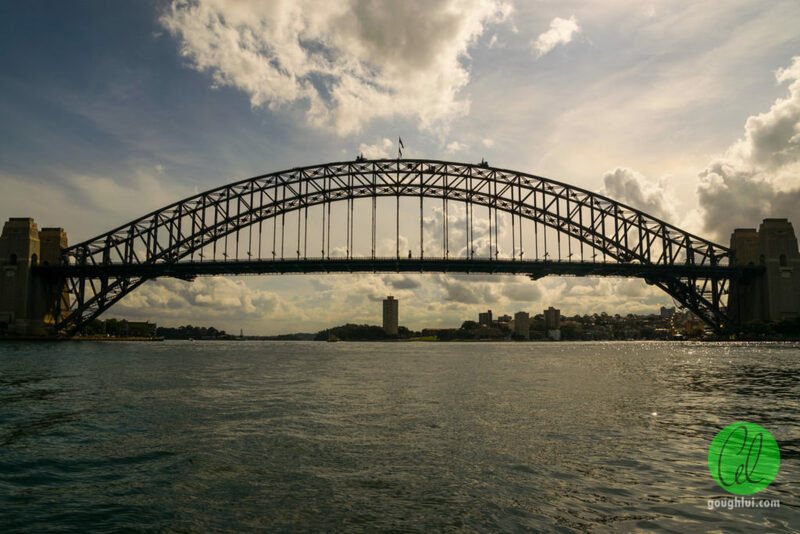 The morning ride was a leisurely cruise towards the south side of Fort Denison. 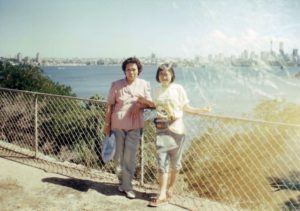 Once arriving at the wharf, I transferred to a waiting 238 bus which took me to the top entrance. The morning started off well, with brilliant sunshine and mostly clear skies. 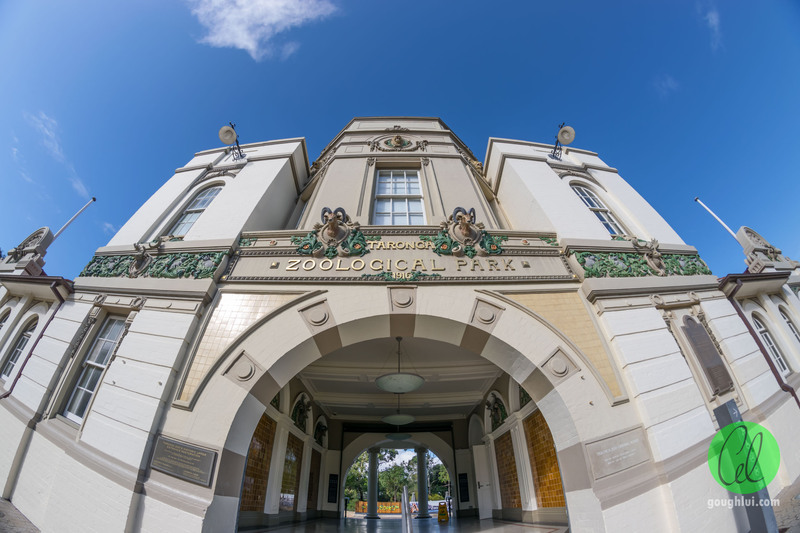 The restored front entrance was looking beautiful as ever, with not many people about. This contrasts with my distinct memories of having to queue outside the gate, and never having a clear shot of the front. The main reason was probably because I visited on a weekday, when the crowds are generally lower, and I visited before the actual opening time. Further to this, they have developed the precinct and now there is a plaza behind the front gate for people to meet others, get tickets, etc. I queued up to grab a ticket, and as promised, I was able to receive the ticket and the special commemorative badge by putting my $1 into the donation box at the counter under instruction of the cashier. I stopped to take some time to talk to the volunteers who were at the plaza before opening, and we had a friendly chat about some of the animals and experiences. I even met some tourists who were keen to share their animal stories as well. 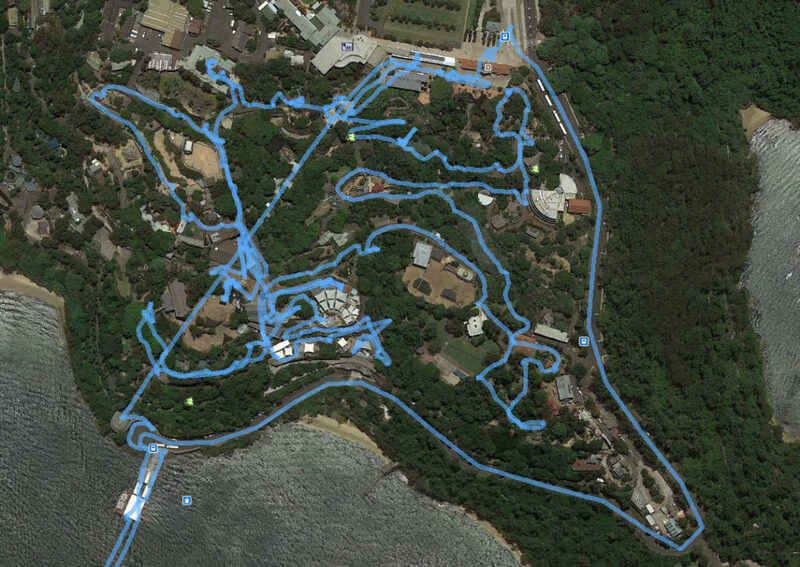 While the zoo has a designated zig-zag path marked by green circles, I decided to instead roam around in an anti-clockwise direction (zoo map, south is at the top) with the aim of visiting as much as I could before my legs got tired. 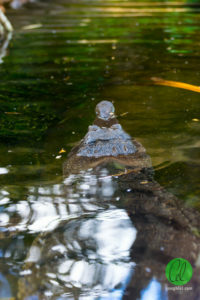 The first stop was the alligators, who were all still warming up in the sun behind a thin wire screen. 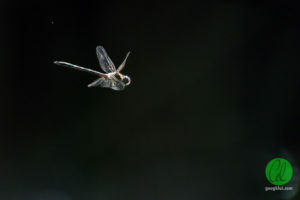 A dragonfly was keen to entertain, however. This was followed by the koalas, where I got very lucky, as they are normally very sleepy animals. Instead, a few of them were quite active, and this one jumped right in front of the camera, swinging from branch to branch as if to greet me. 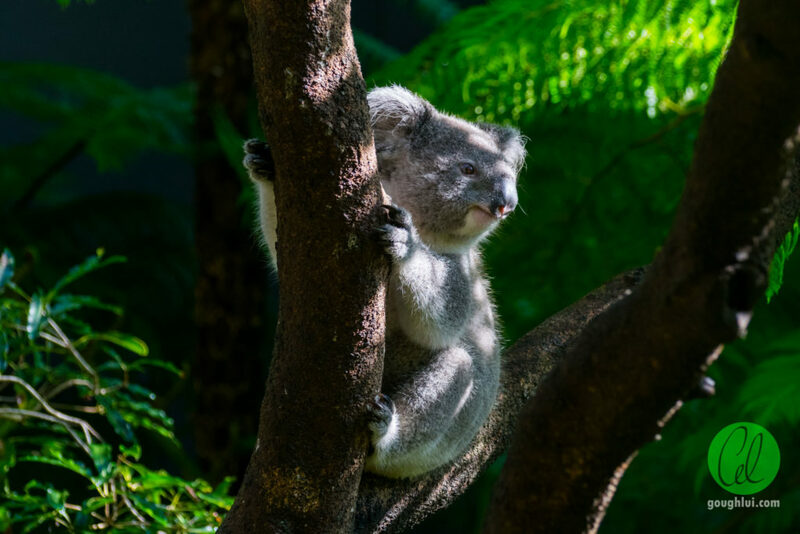 The others hid in the safety of the foliage, slowly chewing away at the nutritionally deficient eucalyptus leaves. I then passed by Reptile World, where I was greeted by a relatively lethargic freshwater crocodile. It was sitting almost motionless in the water, relaxing without a care in the world. Many of the exhibits in this location are indoors, which make for challenging shooting conditions, can be rather cramped, warm and noisy and feels a little dated. However, I did manage to catch a particular lizard with quite bright scales. At this point, I had walked down to the entrance of the African Safari walk, near the construction which will soon be the Welcome to the Wild theatre. There, I met the most charismatic animal of them all – the giraffe (the nickname of Lee Kwang-Soo for Running Man enthusiasts). 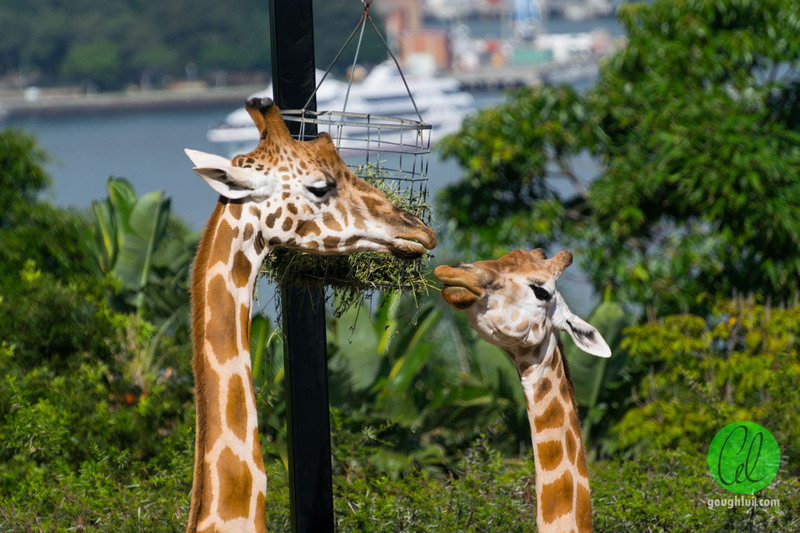 At times, they were almost kissing around the elevated wire mesh feeders, but they seemed rather carefree – free of all the stresses of human life. It seemed that they weren’t even aware of the pristine view they had of the city, nor of the impending change in the weather. Maybe we can learn something from these animals. There was one special giraffe, who seemed to be quite friendly with me. Just as I was walking past the side, it poked its head out and stared directly at me for a few minutes, slowly chewing the food in its mouth. When I walked around towards the upper side of the fence, it followed along and stopped at a feeder in front of my lens. What a bonus! It was nearing time for the 10:15am Elephant Stilt-House Experience, so I rushed on down to the Asian elephants, who were still wearing some of the decorations they had on for Thai new year. 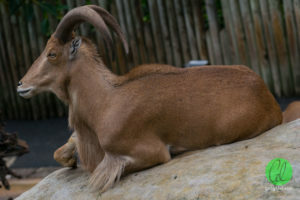 They are this year’s featured animal at the zoo. The food appeared quite indigestible to us, being fibrous, and likely parts of coconut plant trunks or husks. The elephants had a good go at it though, tearing it apart with their muscular trunks and feet, and even dipping it in water to soften it up. Such smart animals! 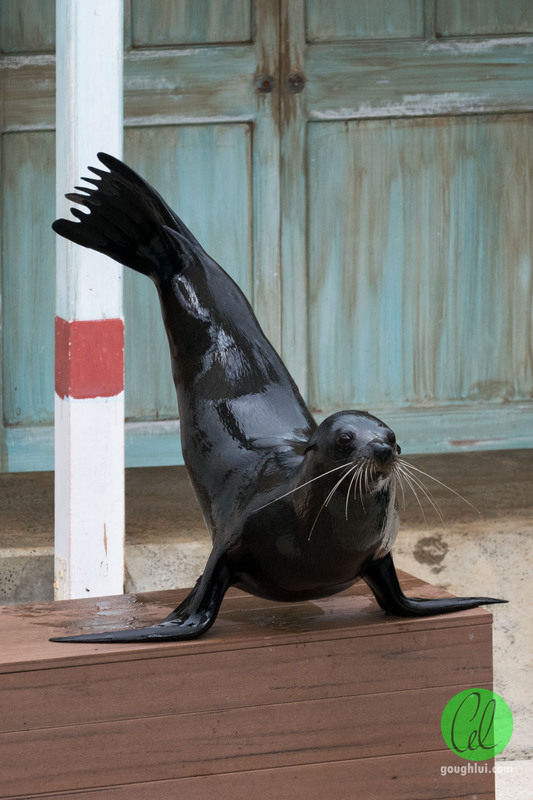 Once I had my stilt house experience, I rushed back up the hill to walk the African Safari trail, so that I could make it in time for the 11:00am seal show. 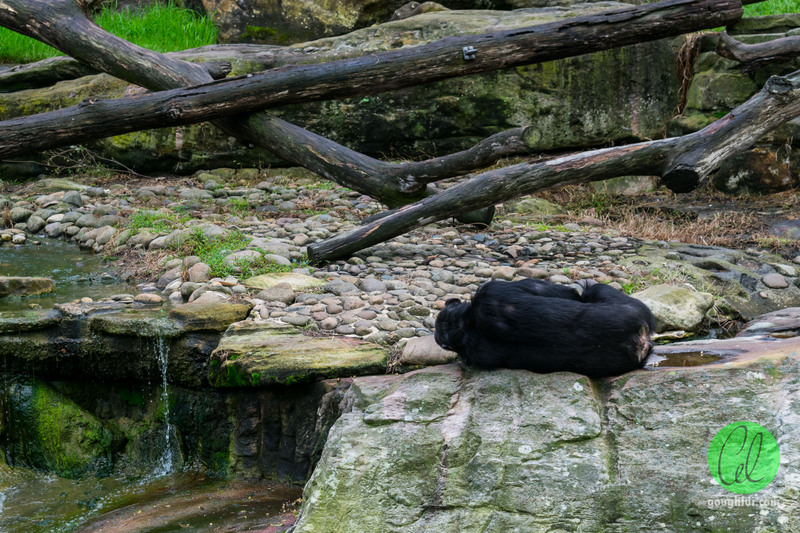 It seems the changing weather had started to dim the skies, and the chimpanzees were definitely feeling a little less energetic than normal. It seems they’ve mastered the art of ignoring problematic humans, so they can live in peace. This one was calmly sleeping on a rock next to a small trickle of water. Another one wasn’t so sure of the visitors and what to make of them and instead huddled itself like a penguin in the upright position while carefully observing. Maybe something had happened? Maybe they had taken away a member of the troupe for medical treatment. 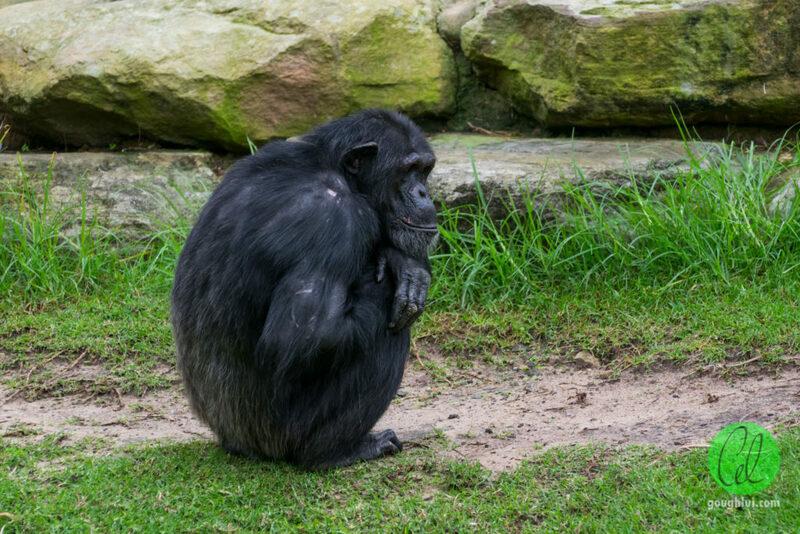 This particular chimp seems to be peering under the flap, waiting for something to happen. In the furthest corner, away from the humans, it seems a mother and father are grooming together while keeping a close proximity to a young baby. I suppose they feel safer that way, being further from potential human contact. 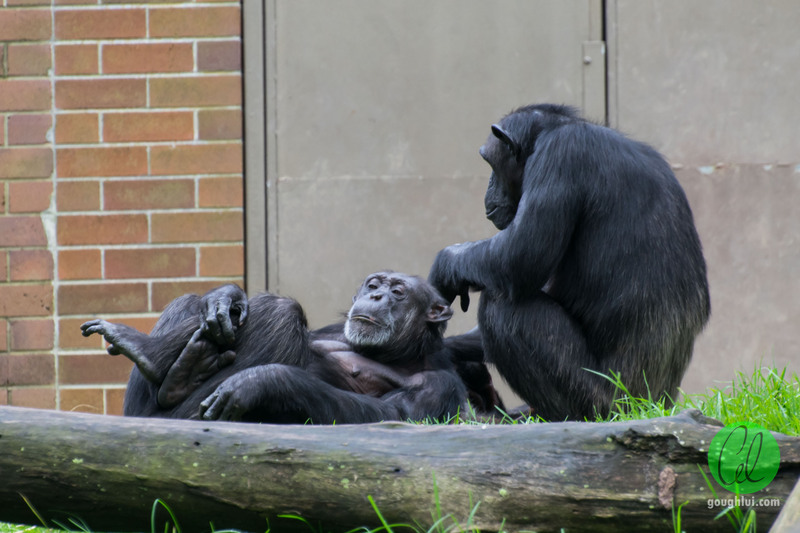 Some other guys were happy to groom together as a team, while one poor guy groomed alone. I suspect he might not have many friends in the group. I then crossed by some barbary sheep, with one of them perched up high on the rock as if to say he was the leader of the herd, and many others resting further down. One had a wound on its leg as if it had been involved in a fight. 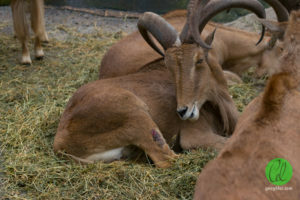 By now, it was nearing 11:00am and I had spent almost 1.5 hours at the zoo. 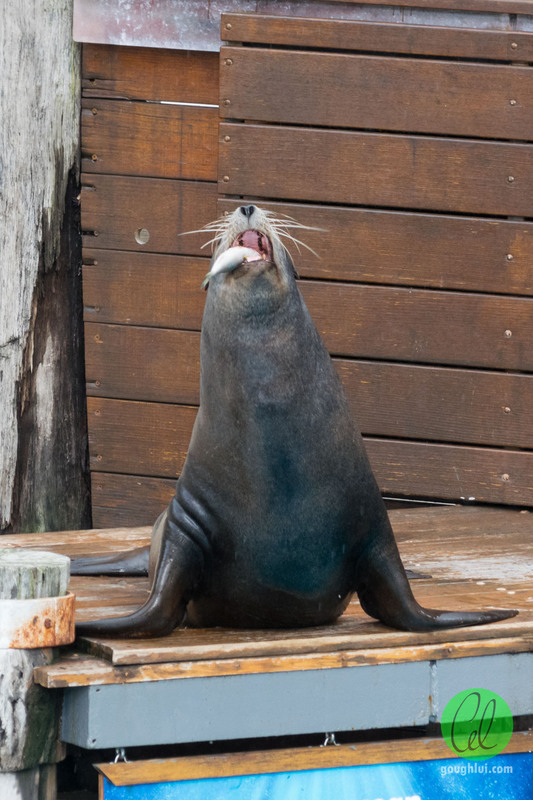 I had to rush my way over to the seal show, but on the way, something funny happened. I’ve always been partial to crows, as they are one of the smartest birds. This time, a mischievous crow decided to show off its skills at pick-pocketing. Because of the crammed space and stair-way access in the theatre, parents with prams are requested to park their prams in designated pram parking areas. 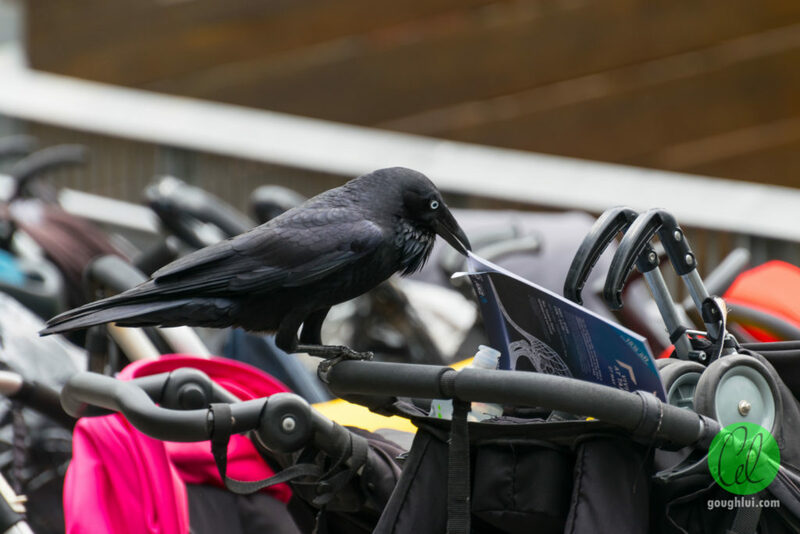 It seems like this crow knows of that policy and knows when the show is about to begin and swoops out of the trees to rummage through the stroller pockets, looking for a tasty treat. 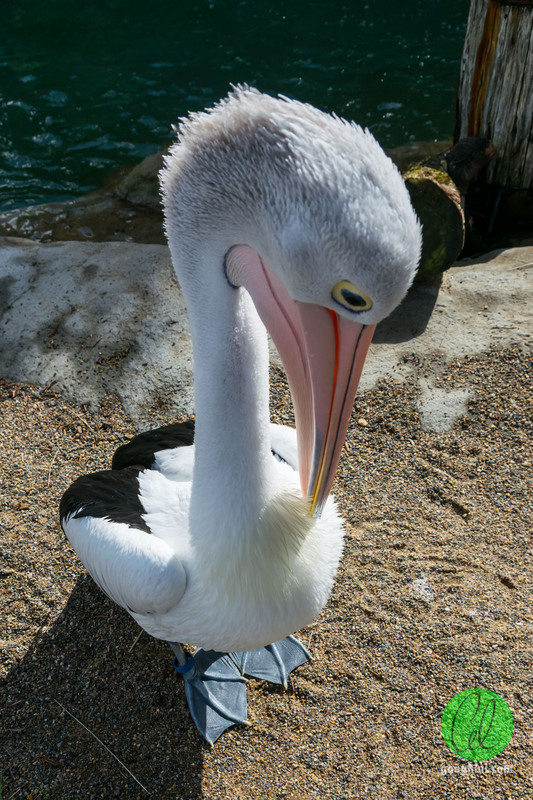 This one seems to know what’s good for it, so he decided to grab a copy of the zoo map. Maybe he needed directions to the other stroller bays? The show itself featured seals and sea lions, and was pretty standard in some sense with the regular seal tricks and displays. 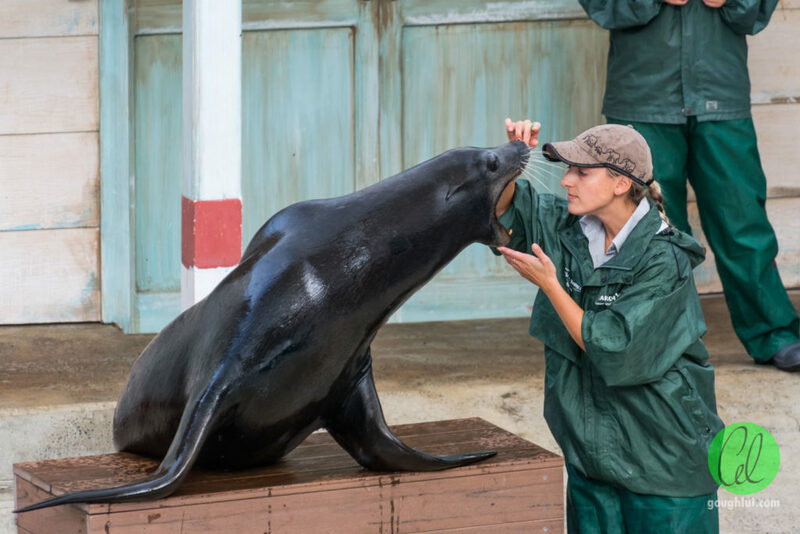 It was amazing to see the amount of training and trust the animals have with their keepers – especially this one where the keeper peers into the mouth. 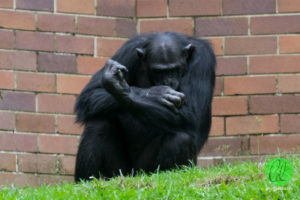 The weather did, however, take a turn for the worse with moderate rain hitting the zoo mid-show which caused a load of parents to suddenly stand up and evacuate to shelter. I decided to stay put in the rain to watch the show, and challenged myself to take more timing critical shots where co-ordinating the shutter would make or break the shot. 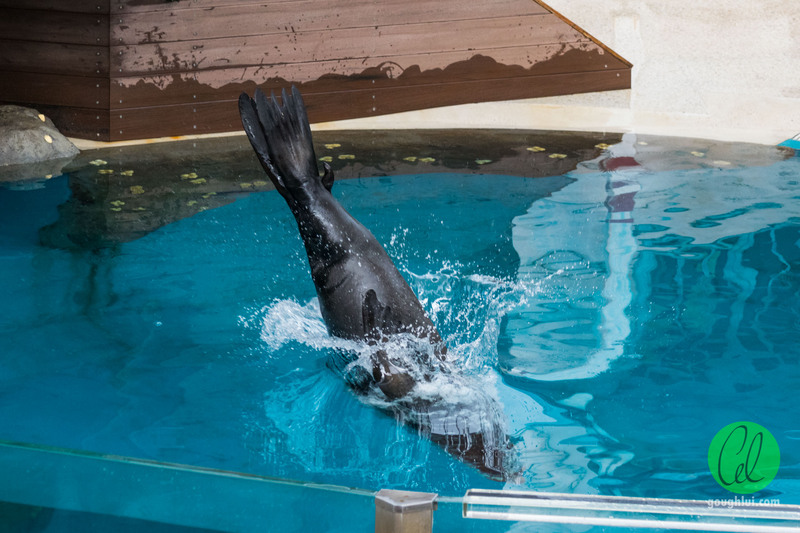 I suspect my self-challenge paid off, as I managed to get a rather splendid shot of the seal entering the water with a nearly symmetrical plume of water around it. 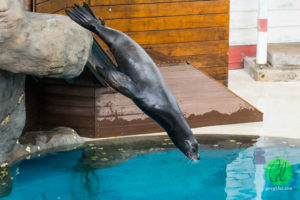 I also caught one of the seal diving into the water from a ledge on the side. It almost looks like a torpedo going into water. 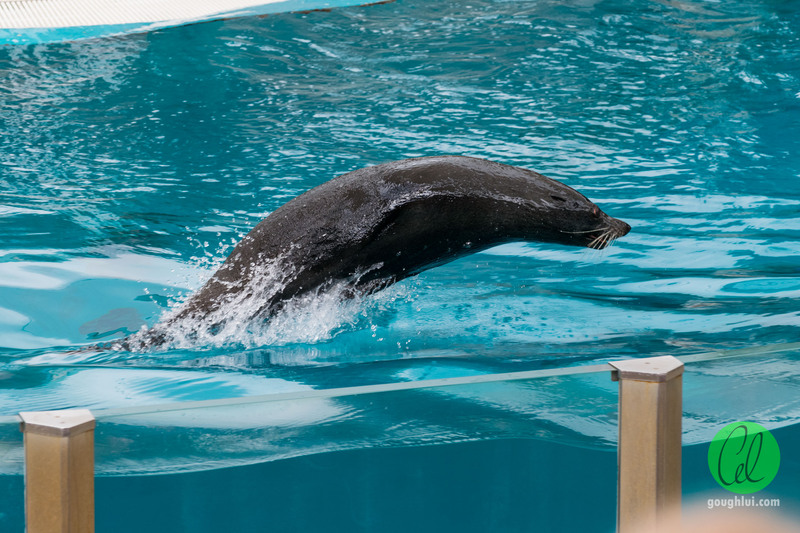 By far the most challenging photo I tried to take was that of the seal porpoising through the water, as it is very rapid and the show only lasts a few seconds. I’d have to say that I got somewhat lucky with this shot, although it probably wasn’t the best. Considering I was sitting in the third-to-last row, in a slightly overcast drizzle, it wasn’t a bad effort. The show itself doesn’t end there, as it is an opportunity for education. 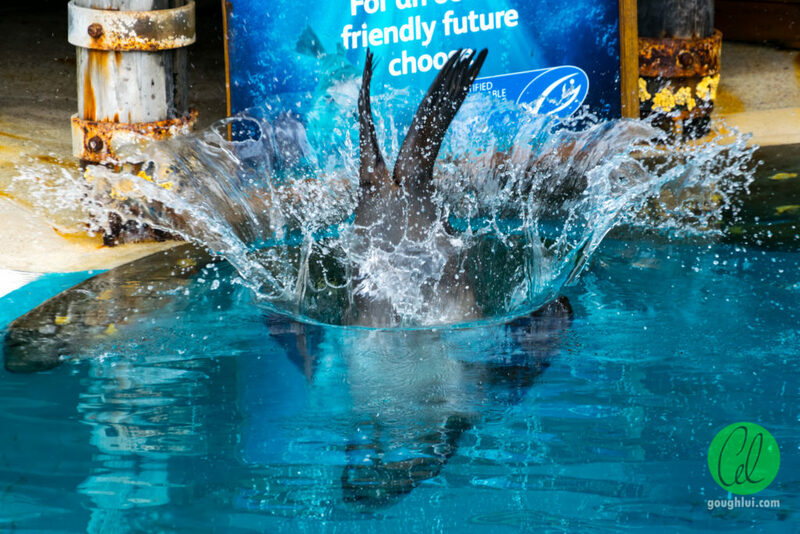 The zoo advises that, when purchasing seafood, people should look for the Marine Stewardship Council (MSC) blue tick label to be sure they are making a more sustainable choice. However, as with any environmental initiative, there are some inadequacies. Because of the route I was taking would bring me further away from the shows as they were scheduled, and I was beginning to feel the fatigue of walking up and down the hill with my photography gear, I decided to go back to roaming in an efficient manner, which meant I missed out on subsequent shows. 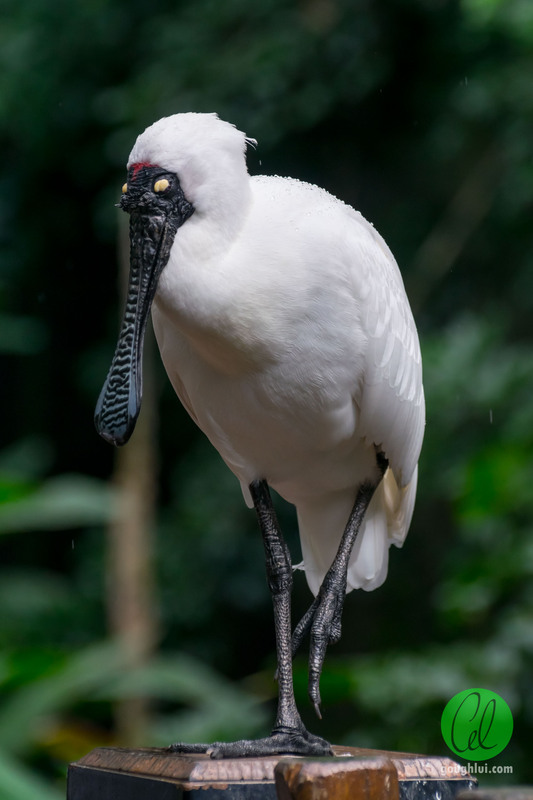 Feeling a little bit soggy, I ventured back towards the rainforest trail in reverse, primarily to visit the wetland aviary. It was there that I came across this bird, in a state of zen, perched on the handrail without any fear of the humans around it. Most people got right up to it, and it wouldn’t even flinch. It wasn’t a stuffed static display – it was definitely awake, shown by the periodic movement of its eyes. Other animals were not as happy about the rain, so they decided to hide under the scrub. 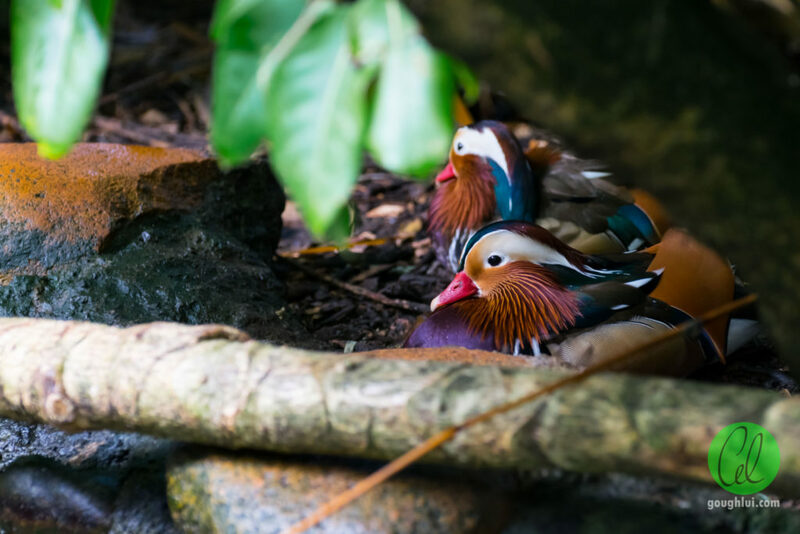 I spotted a pair of Manderin ducks when I knelt down on the deck to get a closer look as to where all the birds have gone. As usual, it pays to keep an eye out as some animals can be well camouflaged. 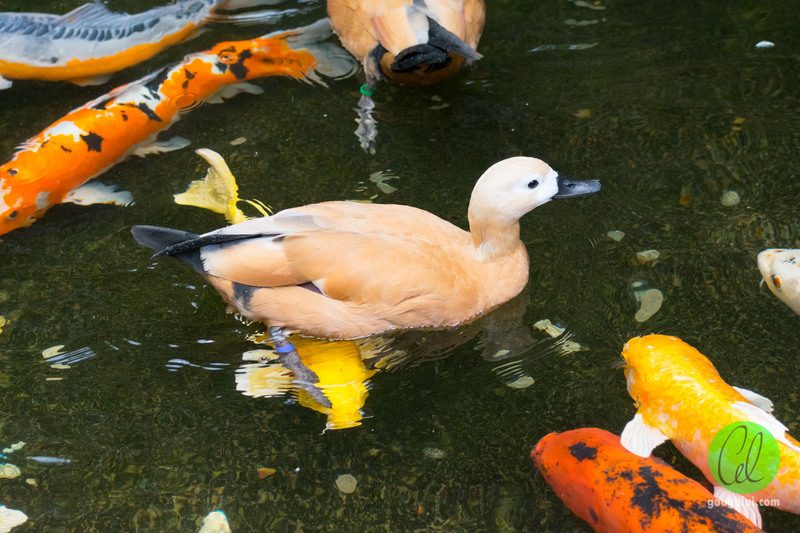 The little pool also had a Japanese garden feel to it, with Koi happily swimming about with the ducks. Maybe I should have paid more attention to the labels as to what species these are … as I mostly focused on getting pictures of the animals themselves, rather than learning their names! On my way to the palm aviary, an opportunity presented itself in the form of an exhibit outside an exhibit. 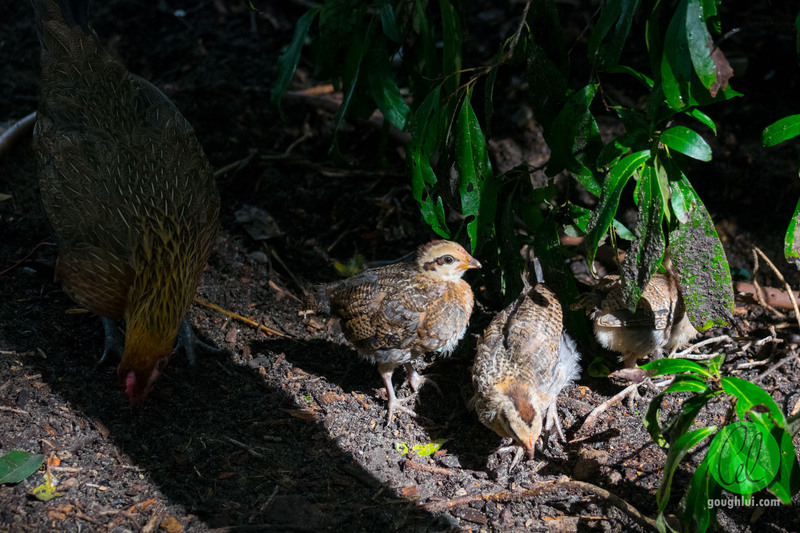 As I heard some rustling noises in the bush, I looked closer to find a pair of chickens, along with a litter of four or five chicks busy working away underneath a bush. 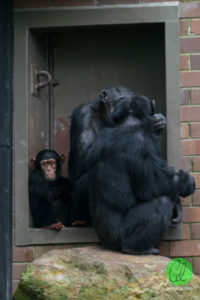 These seemed to be the same ones that were inside the deer enclosure, but might have escaped. I can’t help my instinctive reaction to say that these chicks were awfully cute! 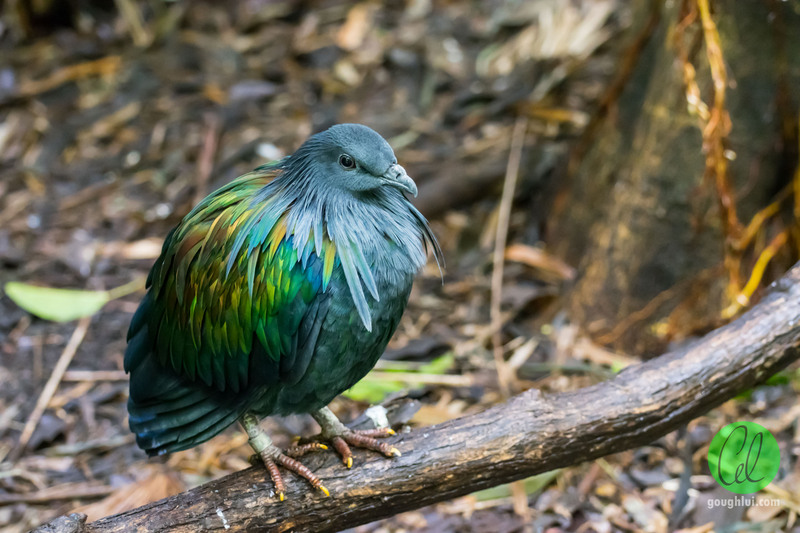 Inside the palm aviary, the lighting conditions were poor, which made for some difficult shooting – but there was the one rather large-breasted iridescent member which made the cut. I ventured back towards the Seal walk, with the route passing the pelicans turning into a great photo opportunity. 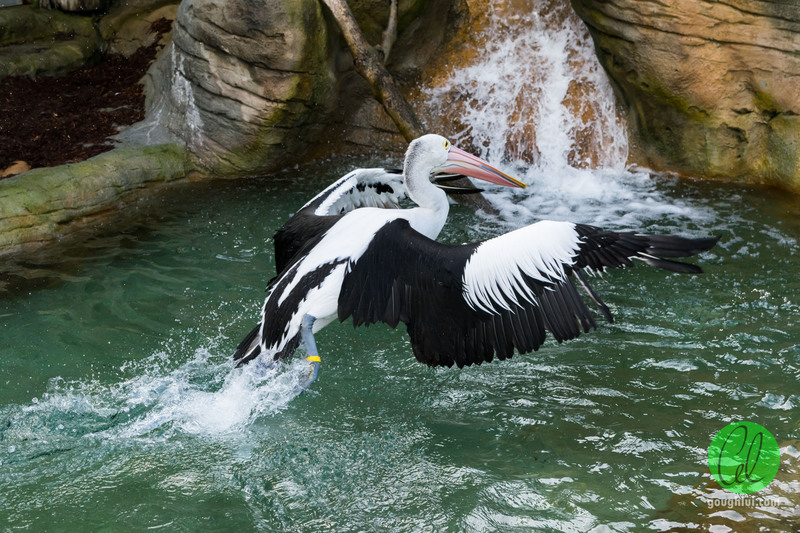 The enclosure housed two, rather opposite pelicans. If I were to name them, the one on the left would be happy, and the one on the right would be sad, as their personalities were completely different. The one on the right stayed on dry land and kept its head down, looking toward its feet most of the time. The one on the left … well, he reminded me of an airplane. Landed and taxiing back to the terminal Oooh, a quarter! 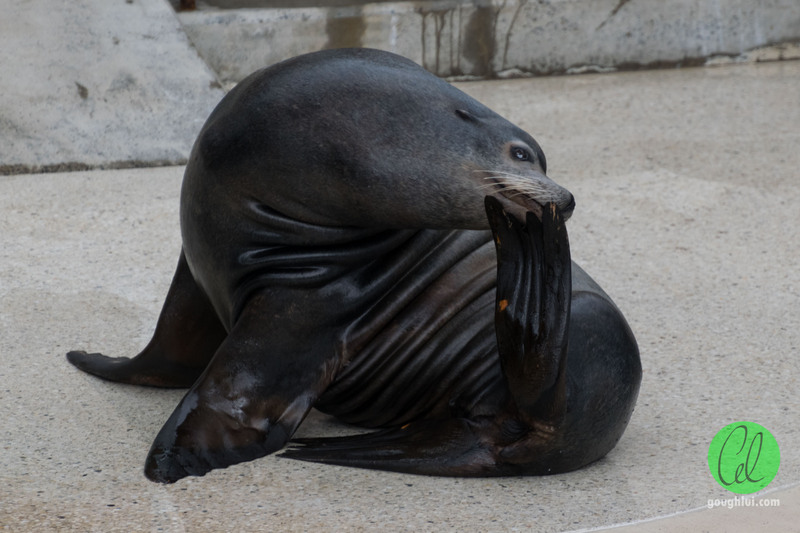 By the time I got to the Seal walk, I was thoroughly exhausted, which didn’t help because this was a pretty hilly part of the park. 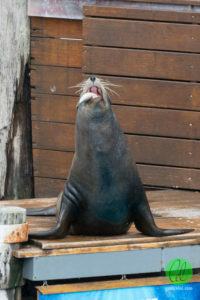 There wasn’t much to see, as it seemed all of the seals had logged off at least, around lunch time. Moving right along, I took a quick walk past through to the Kids’ Trail, although there wasn’t many exciting animals to see. I then decided to walk through the Blue Mountains Bushwalk exhibit, towards the lemurs, to then go back via the Australian Walkabout. Sadly, I had turned up at a bad time, in the “lunch-break” gap when the lemur exhibit is closed. 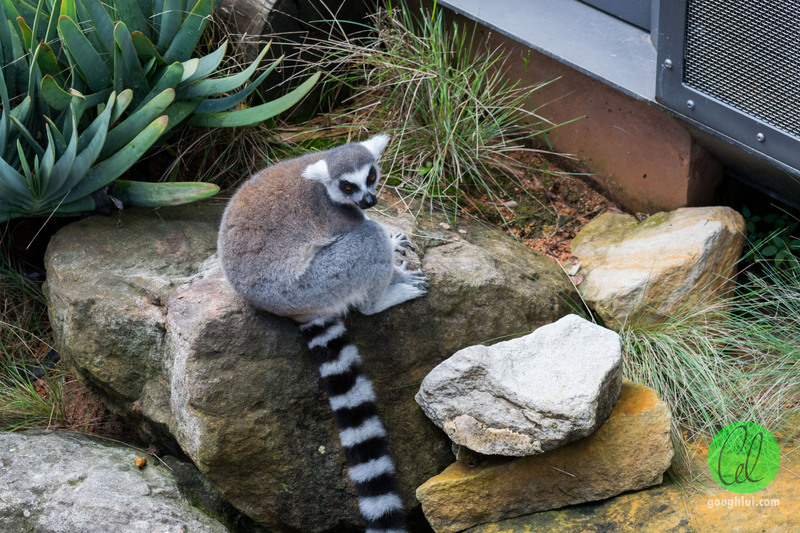 As a result, I didn’t get a chance to walk in to see the lemurs up close, and had to settle for an odd shot of one from the stairway. They don’t look too friendly anyway. It was another case of bad timing at the Australian Walkabout, as their crepuscular sleeping routines meant that many of them were taking a snooze. 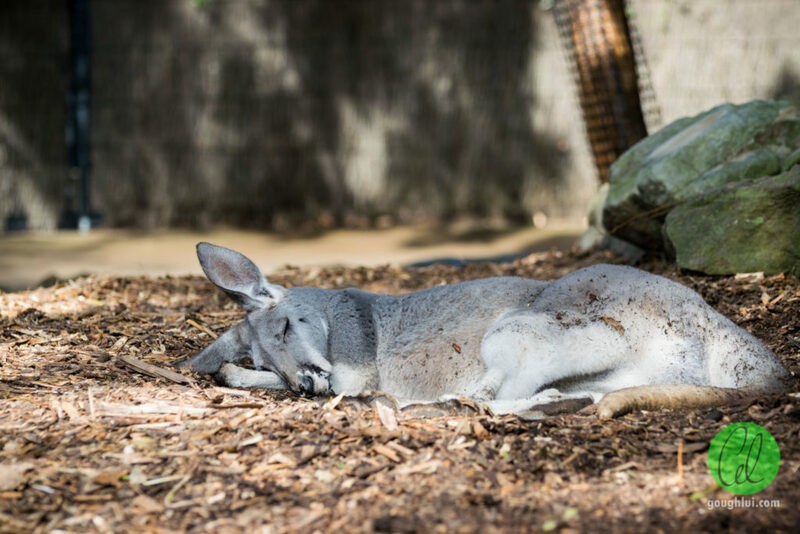 Sweet dreams Mr. Kangaroo. 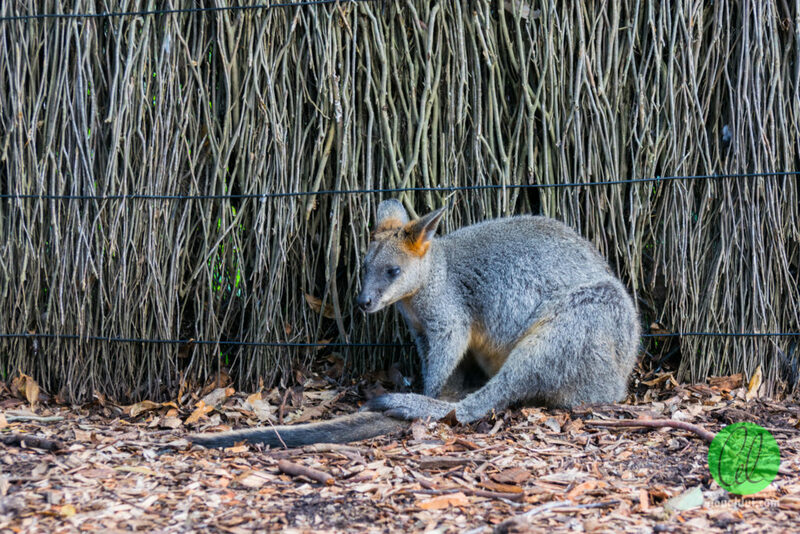 The wallabies seemed to be half-awake still, although almost hung over, leaning on the fence for support. 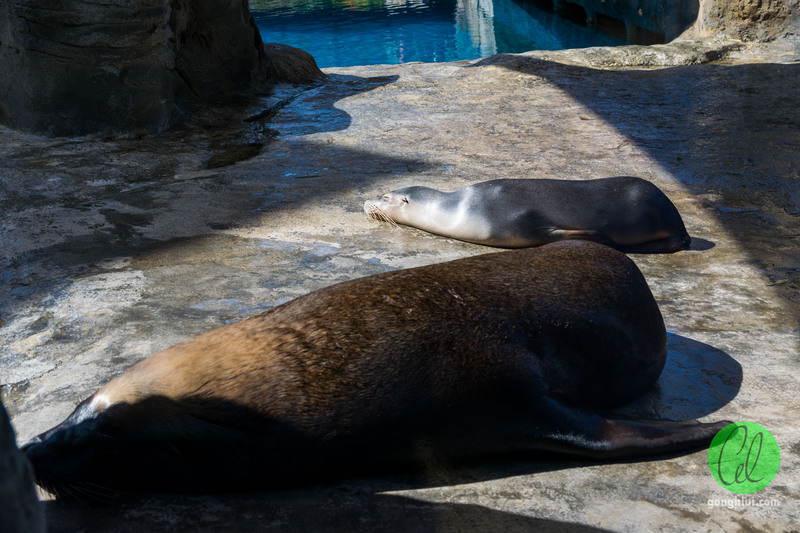 It must have been a long night last night for these fellows. Then I met this possum-like creature … in an inconvenient time. If it could talk, it would probably have loudly protested against this photo. 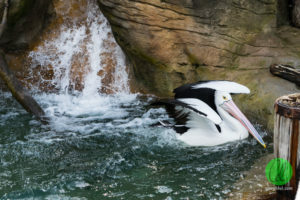 Satisfied with my efforts, I started to consider leaving from the top of the zoo by walking through the Australian Nightlife exhibit, and the Rainforest Aviary, then double-backing towards the tree kangaroos. Ultimately, because of the lighting and temporary unavailability of some exhibits due to breeding, I didn’t take any nice photos. 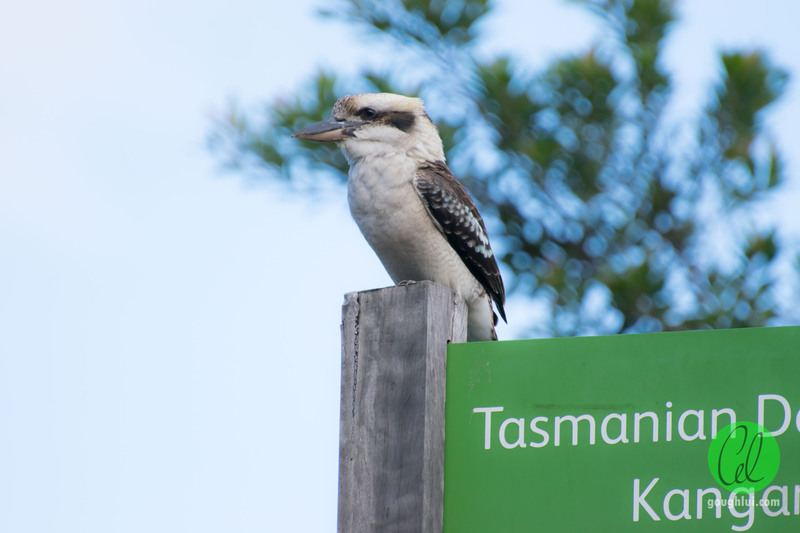 I did spot a kookaburra on top of a sign … another one of those exhibits out of the exhibits. I had decided that I had pretty much expended all my energy at the zoo for the day, and it was best if I started to head home. 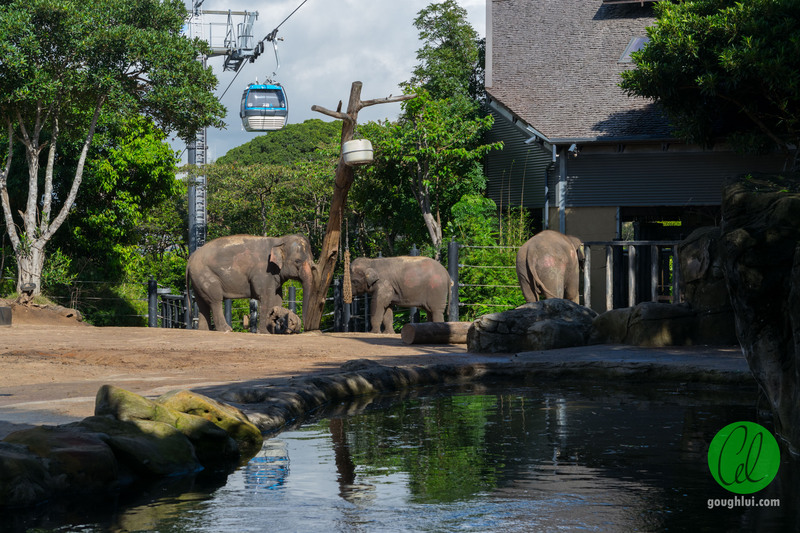 The zoo has one more feature in store – the Sky Safari, a cable car that runs about 440m from the side of the main entrance towards the lower exit near the ferry and bus terminals. 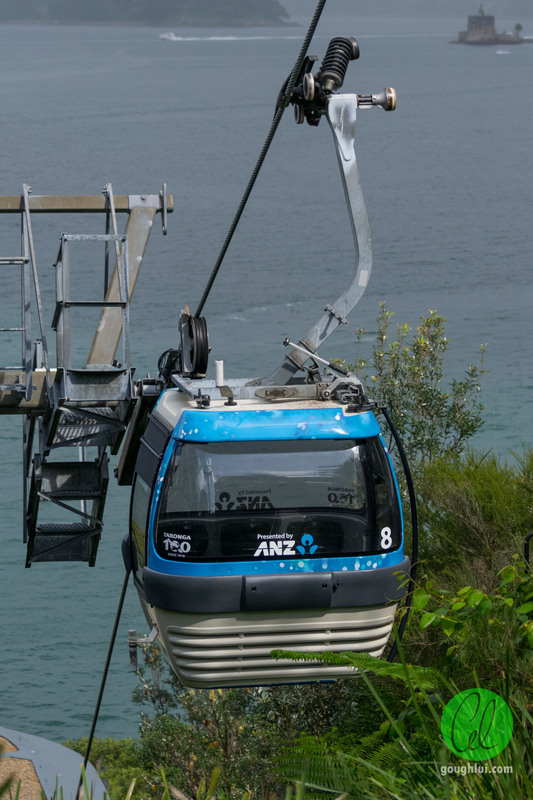 The use of the Sky Safari is included with the entrance fee, and visitors are allowed to (in times of non-peak demand) take round trips to fully experience the view. 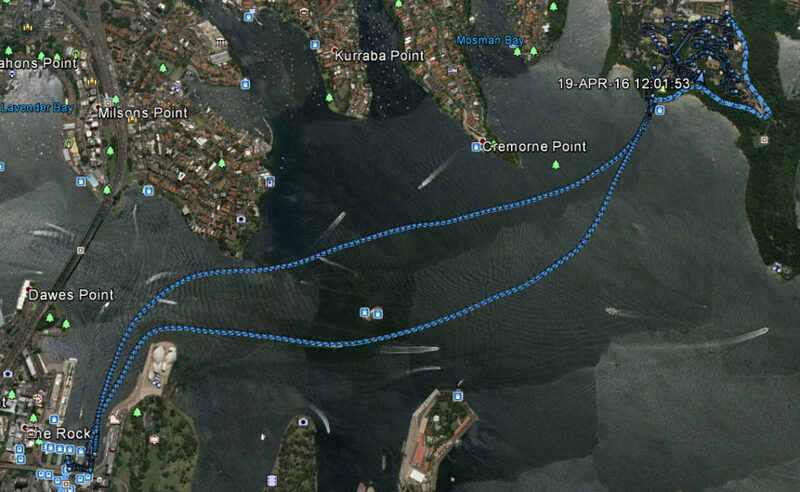 I decided to take a single trip down towards the ferry terminal to make my escape. The view from the car is not as spectacular as I had hoped, with a lot of the area of the zoo blocked by foliage. My fear of heights definitely didn’t help my enjoyment, although the middle elephant exhibit was visible through the clearing, as was some city skyline views. 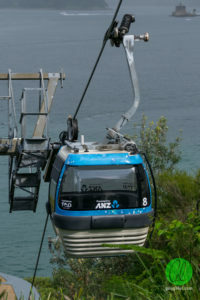 The cable follows a gentle incline most of the way, with a much steeper section just before the lower terminal, and seems to run quite quietly. I spent a total of five hours at the zoo and explored almost every area with the exception of the tortoises, bird show arena, Tasmanian devils, red kangaroo, quokka and wetland birds areas mainly because of my legs, which really couldn’t cope with the uphill and downhill. Overall, I had a great day in talking to the volunteers, learning about, seeing, hearing and taking pictures of the animals and giving my legs a workout. 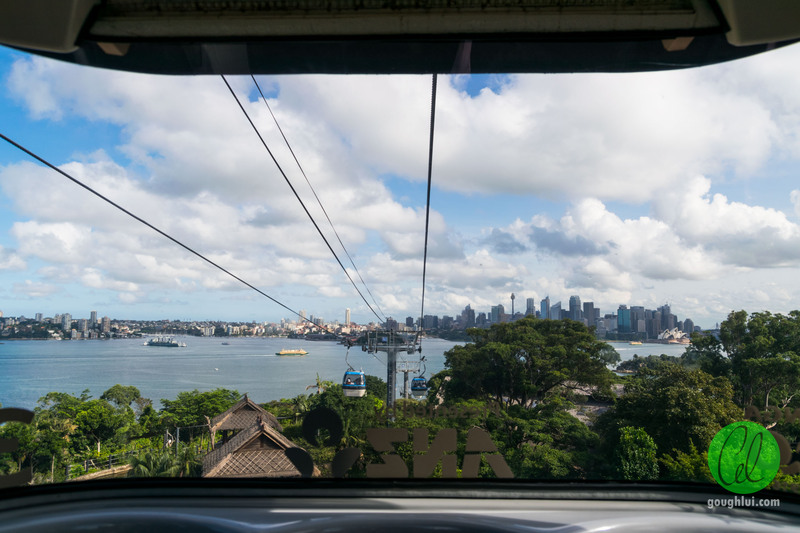 It was heartening to see that even as I left the wharf on a ferry back to the city, that there were queues of people waiting for the Sky Safari cable-car, all waiting to see more animals. The return ride passed closer to the bridge, with the cloudy sky giving a slightly warm afternoon feeling to the Harbour Bridge. 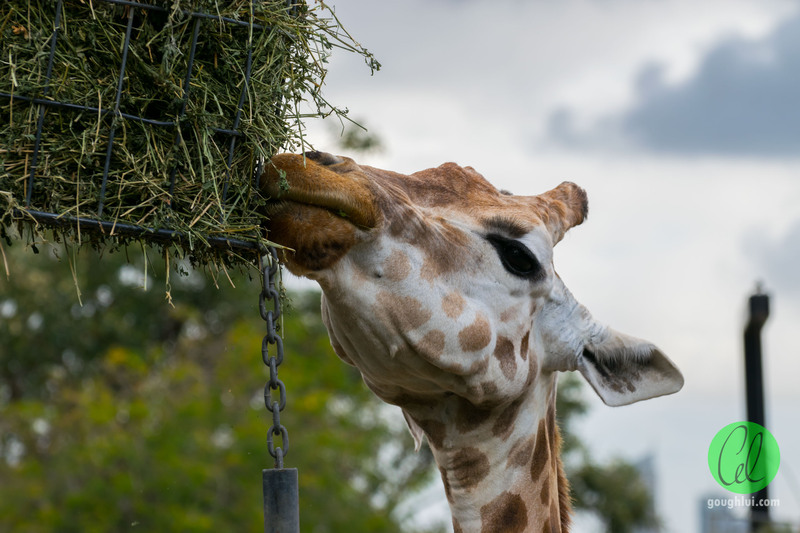 I was most pleased with my day at Taronga, and went right home to start processing photos even though I felt quite exhausted. 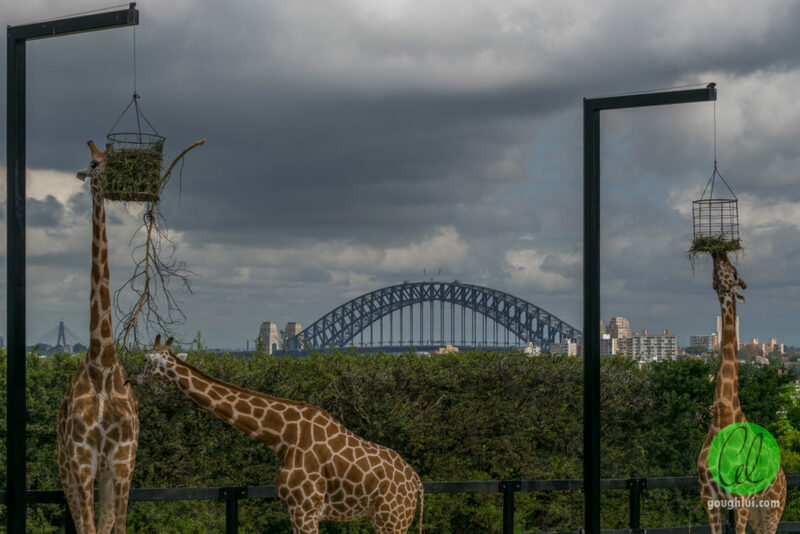 It was a once in a lifetime chance to spend my birthday at Taronga Zoo for $1 in celebration of their centenary and I think it was well worth it. 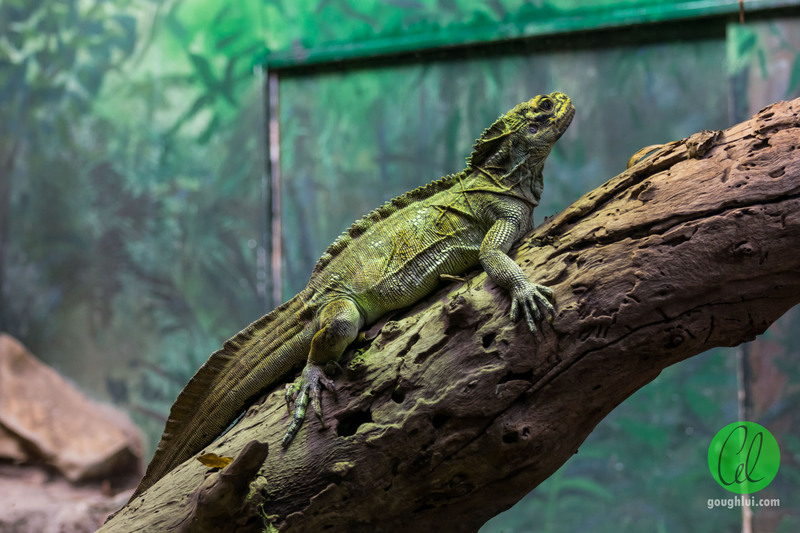 It gave me a chance to escape from my dungeon, reconnect with my photography side, visit the animals, learn about the animals and create new memories. If you have the chance to visit on your birthday, it’s not too late to register. Use public transport. Ferry F2 departs Wharf 2 at Circular Quay for Taronga Zoo wharf and return directly every 30 minutes. Bus 238 can take you from the wharf to the top entrance. You can use an Opal card on these services. Register and visit on your birthday this year, and it’s $1 entry. Plan to spend the whole day, as there are talks, shows and lots of exhibits to visit. 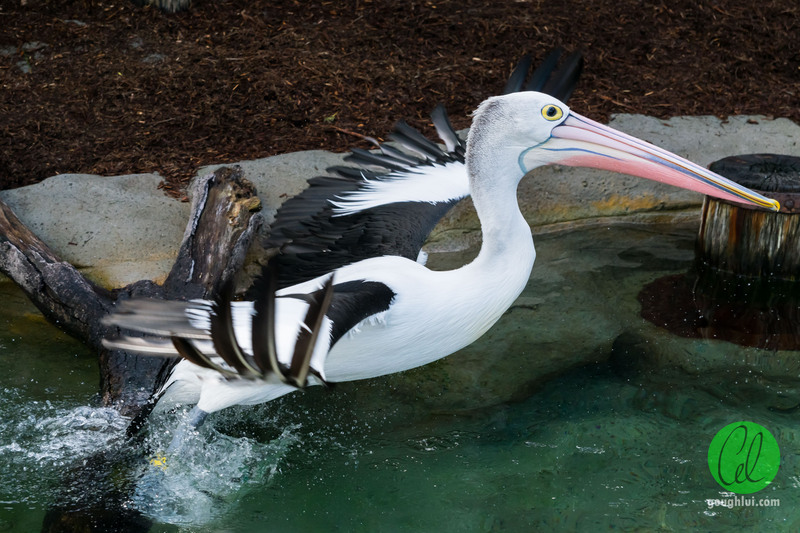 It probably is best if you arrive early as the zoo opens at 9:30am to make the best of the day. Plan ahead by checking the program online and setting timed reminders on your phone. Wear comfortable walking shoes, as it’s quite a walk and on an incline. Bring adequate sun protection and refreshments in case you need them, as some of the shops can have quite a sizeable queue around lunchtime. 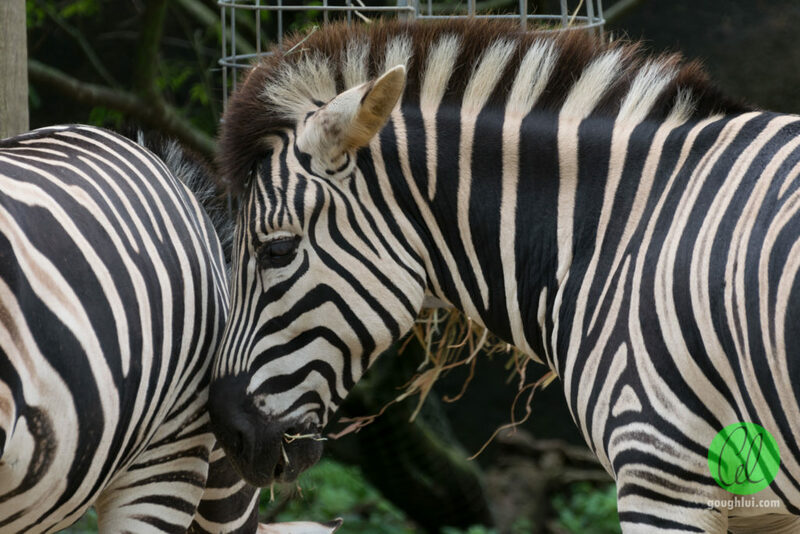 Keep your eyes and ears peeled – animals can camouflage well, and know all the best hiding spots, so be extra alert to make the most of your time. 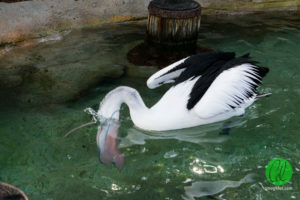 Some animals can present themselves outside of exhibits as well. Be patient – as a photographer or a visitor, there are so many things you can’t control, e.g. the weather, the behaviour of the animals, the crowds. Sometimes it pays just to wait a little while and something might happen. 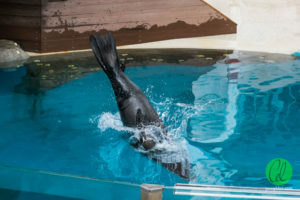 Otherwise, visit again at another date, maybe a weekday when crowds are reduced. Be respectful – I’m sure the animals appreciate if you don’t bang on the glass, poke them, fire flashes into their eyes or yell at them as some of the kids seem to love doing. 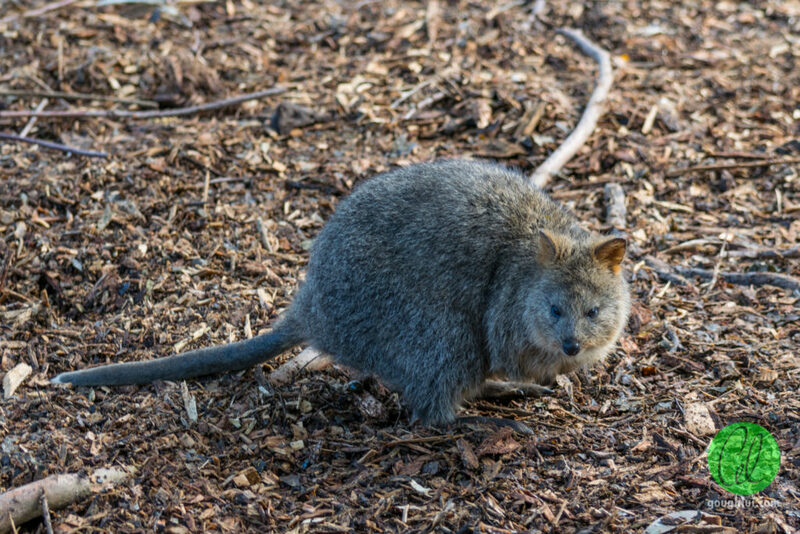 I’m sure that they will also appreciate if you stick to the signed paths and not walk over the bush which can damage their habitat. 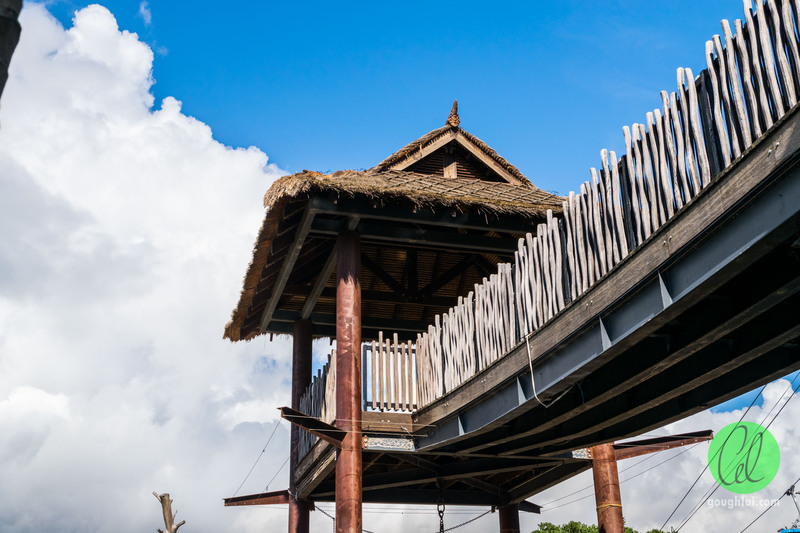 Perhaps utilize the Sky Safari to reduce your walking by exploring from top to bottom on one side, catching the Sky Safari back to the top and visiting the other side, before leaving via the bottom gate which is close to public transport (i.e. ferries, bus). This can be problematic around mid-day as crowds build. It may make sense to explore the Australian bush animal exhibits first, as their crepuscular sleep cycles mean that they like to doze off in the middle of the day. 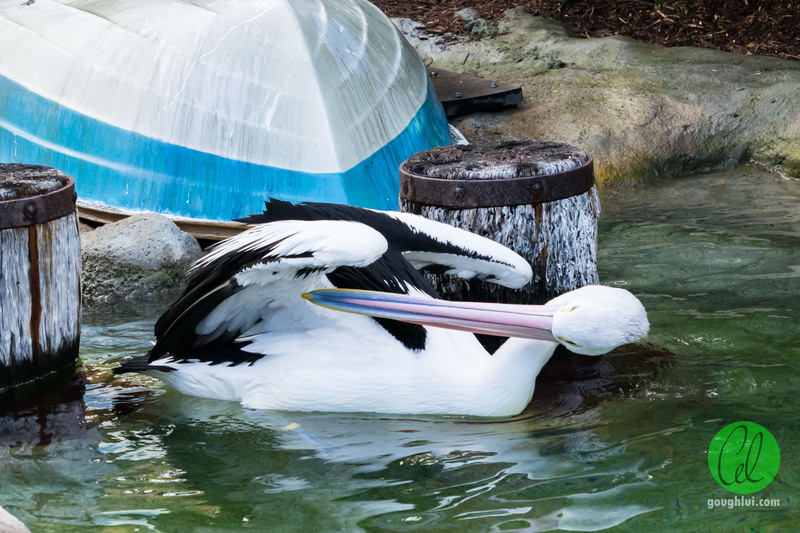 Bring your equipment – photographers especially will benefit from a quality zoom lens for getting up close to the animals. 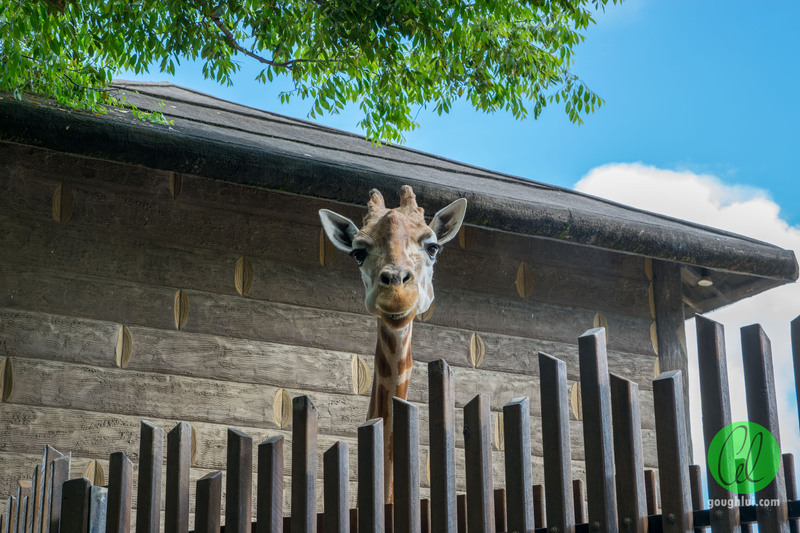 Enjoy what you can and don’t be disappointed – sometimes you just aren’t lucky and your favourite animals are asleep or on the far side of the enclosure. 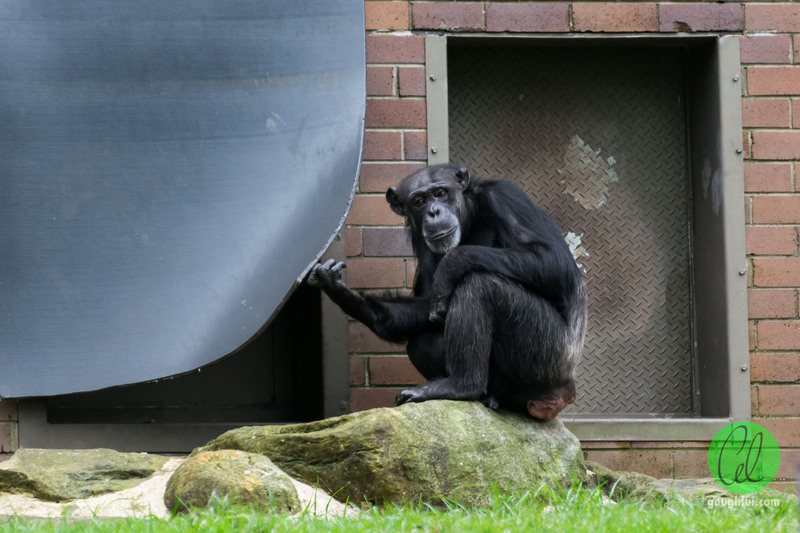 Other times, the animals are behind thick glass or meshed enclosures which make for poor photo opportunities, or the placement doesn’t allow for effective composition. It’s a bit of a luck of the draw – sometimes you get lucky, other times you don’t. 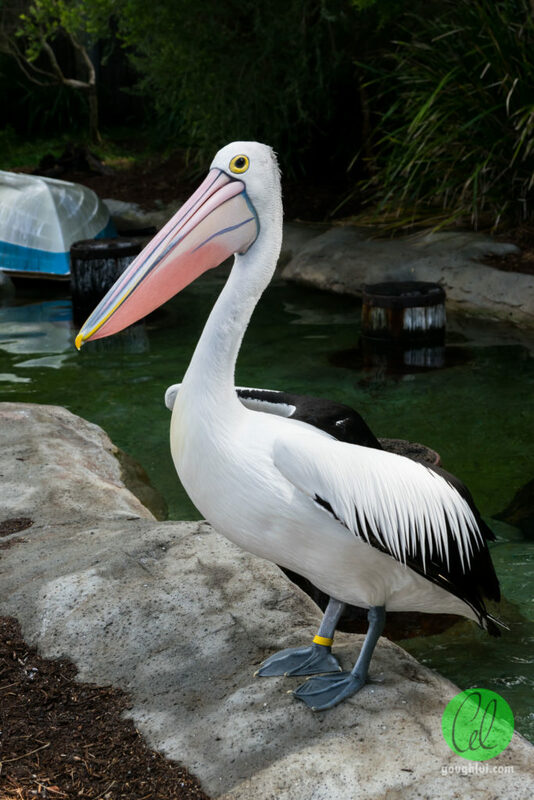 Zoo maps on stands are sometimes oriented differently resulting in confusion – look up the location of the front gate as a reference or use the free paper-map provided at the entrance. 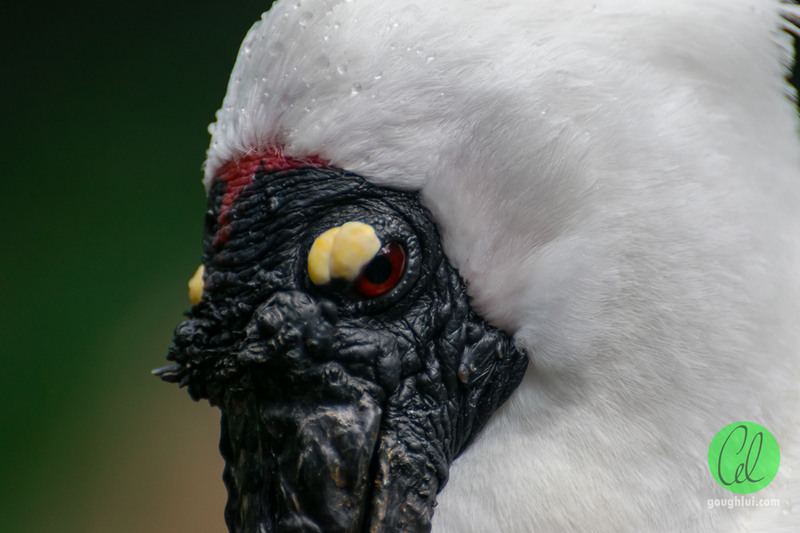 This entry was posted in Event, Photography and tagged event, photography. Bookmark the permalink. I’ve never been to Taronga Zoo, it looks like it might be worth a visit with the kids when they’re a bit older. Happy birthday!